Microsoft’s Autorecover is a lifesaver. Have you ever worked on a document in Microsoft Word or Excel for several hours and then accidentally clicked “Don’t Save” when closing the file to log off? Or maybe you experienced a power outage or your computer suddenly crashed. If you’re like me when this happens, you go straight to panic mode and start trying to remember when was the last time you hit the save button. Fortunately, Microsoft Office Suite has the AutoRecover option enabled by default for Excel, PowerPoint, Outlook, Publisher, Visio and Word. Here’s how to take advantage of it. The menus will look a little different depending on which version you are using (2010, 2013, 2016) but these steps are the same for all. First, you should check that AutoRecover is setup properly. Go to File > Options > Save, and near the top you’ll see the option to Save AutoRecover information every x minutes. By default, this is set to 10 minutes. Feel free to change this to whatever works best for you but note that AutoRecover consumes resources, so too frequent an interval could slow things down a bit if your computer is older. Look right underneath that for the next option, Keep the last autosaved version if I close without saving. Make sure the boxes in front of both of these options are checked, then click OK. So here’s what to do when you need to recover something. If you had saved a file, but you experienced a sudden power outage or something that led to unsaved changes, you have a chance to get the lost progress back. Open the file you were working on, then go to File > Info. Under Manage Document (or Manage Workbook for Excel, Manage Presentation for PowerPoint) you should see a file with a date and time beside it. Click on the version you need then select Restore in the bar at the top of the page, and your file will overwrite any previously saved versions. If you were working on a file and it didn’t get saved at all, click File > Info > Manage Documents > Recover Unsaved Documents (or Unsaved Workbooks for Excel, Unsaved Presentations for PowerPoint.) Once you select the file that you want to recover, click Open. 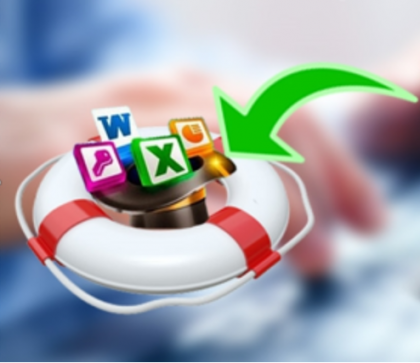 Save your recovered document immediately!